Caution! Might You Be Engaging in Parental Alienation? When your marital relationship ends, it doesn’t end with happy thoughts or feelings. Well, perhaps some, but that is not the direction we’re headed with this article. It may be a relief that you are out of a bad marriage, but it comes with the knowledge that your lifelong hopes, plans, and dreams with your chosen partner have vanished. In the short-term, it may be very difficult to stifle outward expressions of your disappointment, anger, and disdain towards your ex-wife or ex-husband. For some, it can be difficult even over the medium-term or long-term. These bad feelings will surely be exacerbated by a child custody fight and having the kids thrust into the middle of more acrimony. These feelings can be dealt with through counseling, coming closer together with family and friends, or some combination thereof. It’s truly very important to find your way to a place where, at the very least, you are able to put away those ill-feelings when the children are around. This takes time and requires guidance from a professional and/or trusted people who are close to you. Being the “good parent” – the one who doesn’t overtly engage in what we have come to understand as parental alienation – it can still be quite easy to slip-up and engage in behaviors that are typical of someone who is attempting to poison your relationship with the children in the wake of the divorce. The intent may not be there, but the effect on the children of seeing you upset, saying bad things about your ex-wife or ex-husband, and forgetting that these children still love both parents can still chip away their innocent souls. Regardless of your feelings about your ex-partner, never lose sight of the fact that the children are the innocent bystanders. They love you both. It’s important, too, that they do. Remain focused on the children, they’re interests, stories they want to share with you (including positive ones involving the ex-wife or ex-husband) and put on that face that shows them you’re interested. Work on your self-discipline to prevent “slips” before they happen. If you want to complain about a situation that involves the ex-partner, do it when you’re by yourself (making sure that no one sees you) or when you’re out with friends or anywhere else that is away from the kids. Don’t use the children as messengers or as “go-betweens” on any matter. Anything that needs to be addressed should be addressed with your ex-spouse. Consider using low-contact methods. Always be cognizant of your choice of words and your actions, including facial expressions, in front of the children. It’s hard to hide rolling eyes and a frown. Remember always that the children are a part of both of you. When you demonstrate negativity about your child’s other parent openly and in front of them, they are likely to view you as being disappointed in a part of them, too. This can have devastating long-term consequences. Remember this even if your partner is engaging in parental alienation throughout and even beyond your child custody litigation. 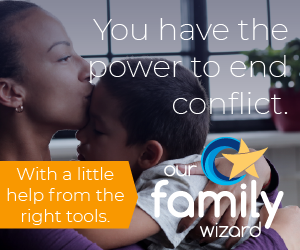 If you handle your side of the equation positively, you greatly increase the likelihood that when the children are grown, they will remember who bashed whom and who did not. Make the person that did not – you!